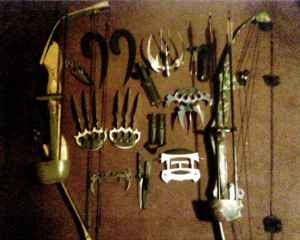 I saw your ad on craig's list for the knives and bows http://newyork.craigslist.org/mnh/for/1048758719.html . I think that this is the type of set that I am looking for, since I am frequently attacked by video game dragons. Does it come with any spells? Those look pretty badass, but I wouldn't buy them unless the seller threw in a complimentary magic missile.